Two entertainment professionals try being married for six months just hours after they meet. Whoever wins the bet gets the deal of a lifetime. Model and aspiring actress Leila Darling couldn’t care less about the vodka she’s hawking in Las Vegas, but when she finds herself pulled into an unconventional bet with television producer Carter Bain, she surprises herself by accepting the terms—a friend thinks it will help both of their images to settle down and get married, and if one of them leaves before six months are up, the other gets to pick which of Carter's TV shows to cast Leila in. Now, suddenly married though still near-strangers, Carter and Leila have to work their ways through the minefield of public and corporate life in order to successfully arrive at the bet’s best conclusion. But what neither expected was that they might develop feelings for each other on top of their obvious physical attraction. The third book in Jackson’s (To Me I Wed, 2017, etc.) 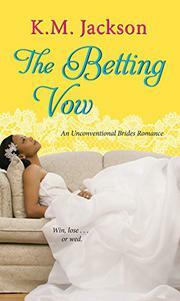 Unconventional Brides series, this volume pulls out laughs and sighs in the same way the earlier books do. While some of the dialogue is a bit stilted and overly old fashioned, Leila and Carter's communication, whether banter or heart-to-heart, is real and heartwarming. Still, the pacing leaves much to be desired, and the story alternates between lots happening and nothing at all. The ending is somewhere between abrupt and obvious, but strangely, even though there is too much book, there isn’t enough story. A sweet romance that can leave a reader both satisfied and wanting.